Lapis Lazuli is an opaque conglomerate of dark blue lazurite streaked with white calcite, or sprinkled with gold specks of pyrite. Lapis may also include small quantities of augite, diopside, mica, and hornblende. This mixture is found when sodium, aluminum, and cufl cium combine but lack sufficient silica to form a feldspar. Lapis belongs to the isometric crystalline system and has a hardness of 5-6. 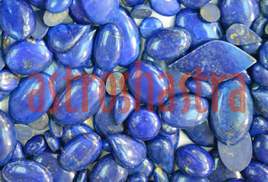 It is a soft gem stone of blue colour. It should have some natural little gold spots. It represents tenderness, sympathy and love. Its use is recommended for those, who are born under the solar sign Taurus. It is particularly favourable for ladies engaged in music dance, drama. It is also helpful to those who believe in subtle values. Persons using this gem will be known by their powers of love and affection and can generallly win over others through the powers of love. They would find that they can transmit love to others with ease and confidence. They would also love peace and harmony and acquire an optimistic outlook. It is a Blue rock made up of several different minerals, Including Lazurite, Sodalite, hauyne, Calcite and pyrite. The colour of lazuli varies as per composition but the intense blue variety with minor patches of white calcite and brassy yellow pyrite is the best quality. 1. It increases strength, virility, vitality, and oxygenation of blood, mitosis, hearing and immune system. 2. It decreases poison, fever, depression, melancholia, neuralgia, spasms, tonsillitis, and anxiety, hodgkin's disease. Cancer of the larynx, autism, urinary troubles, tuberculosis, hemorrhoids, jaundice, diabetes, insomnia, neurosis, vertigo and dizziness. 3. It helps in balancing emotions, vocal cords, thyroid, esophagus, bronchial tract, bone marrow, skeletal system and Eustachian lube. The ancient people used this gem becuase of its high healing power. It was known to protect the wearers from melancholy and depressing outlook and from intermitent fevers and eye infections. The gem is good for general prosperity and happiness. It is good for the physical as welll as emotional well- being of the wearer. It also helps in sustaining their determination and stamina. Generally, it protectsthe wearers from dangers of any kind. The wearer will acquire and build up sufficient financial reserves. It heals all sorts of liver and stomach problems very quickly. Those, who are lucky to acquire this gem and use it will be considered to be most fortunate and blessed by the Goddess Bhagwati. They will never be found to be wanting in money or love. It will also avoid misunderstandings between loved ones. It safeguards against the adverse Saturn. It protects natives of birth no 9 who are accident prone. Its evocative name is a combination of the Latin word lapis, or "stone," and the Arabian name azul, meaning "blue." It is composed of grains of several blue minerals, including lazurite and sodalite. It is a rock composed of a mixture of several different minerals including lazurite, huaynite, sodalite, noselite, calcite and pyrite. Lapis generally occurs with a speckled and strained consistency, with glittering inclusions of iron pyrite. The presence of iron pyrite deposits within a specimen would indicate that is most likely authentic and has not been reconstituted. Why is Lapiz worn : Lapis facilitates deep meditation and can be used to journey back into past lives. It is a very spiritual stone, which can also be used in ceremonies. It is also said to impart ancient knowledge and wisdom, bringing peacefulness and self-acceptance. Legend associated with Lapiz: It was created millions of years ago in the course of a metamorphosis, turning chalk into marble stone. Persian legend says the sky owes its colour to a giant slab of lapis upon which the earth rests. The Romans believed that lapis was a powerful aphrodisiac. In the Middle Ages, it was thought to keep the limbs healthy and free the soul from error, envy and fear. It was one of the stones in the 'Breastplate of Judgement' of Aaron, described in the Bible. Where is it found : Afghanistan. Chile, Siberia. Colourado, and Myanmar.